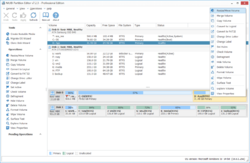 Best Disk Partition Manager for Windows PC. 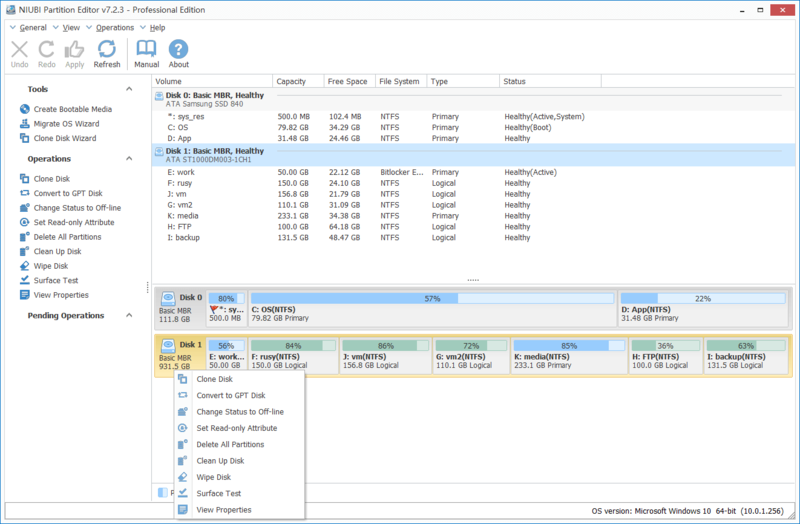 NIUBI Partition Editor Professional 7.2.3 was available as a giveaway on October 25, 2018! NIUBI Partition Editor Professional Edition is disk partition manager software for Windows. It provides basic partition management ability to create, delete, format partition, change drive letter, etc. Advanced management to shrink, extend, move and merge allocated partitions without data loss. Disk/Partition clone to back up data and migrate OS. Convert type of disk partition without losing data. Scan bad sectors, set partition active, set disk read-only attribute, defrag, hide, wipe, check partition, etc. 1 Second Rollback – If any software error or hardware issue occur, it automatically reverts the computer to original status in a flash like nothing happened. Advanced file-moving algorithm – resize/copy partition 30% – 300% faster than other tools. Hot-Resize – Change partition size in desktop without rebooting. Virtual Mode – the operations you do will be listed as pending for preview, undo or redo, real disk partitions won't be modified until click Apply to confirm. Cancel-at-will – Cancel the ongoing but unwanted operations without losing data. 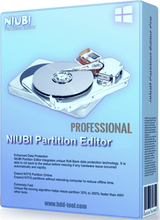 How would you improve NIUBI Partition Editor Professional 7.2.3? Covers all features of Professional Edition, supports Windows Server 2016/2012/2008/2003 and SBS/Home Server. I don't see a way to change a logical partition to primary. Tried to move Windows 10 OS from a 2X 240GB SSD Raid 0 Setup to a single 500GB SSD and it starts and seemingly completes. However the OS will not boot, first time I got startup repair when I changed partition sizes. Second time when I left it identical to the original partitions it just said to select "proper" boot device so it didn't recognize it at all. It shows up as an unallocated disk after booting to the original disks. But I guess it's still better than (old software versions) HDDClone 3.9 Pro, Acronis Disk Director Suite 10, Acronis true image (2011 and before versions tested, I have 2 versions) as they either did not detect the drives (as raid din't seem to be supported in HDDClone) or TrueImage didn't boot from the CD properly so it probably doesn't support raid either. Disk director suite complains about there not being enough space, which isn't true.. Tried to move Windows 10 OS from a 2X 240GB SSD Raid 0 Setup to a single 500GB SSD and it starts and seemingly completes. However the OS will not boot, first time I got startup repair when I changed partition sizes. Second time when I left it identical to the original partitions it just said to select "proper" boot device so it didn't recognize it at all. It shows up as an unallocated disk after booting to the original disks. But I guess it's still better than (old software versions) HDDClone 3.9 Pro, Acronis Disk Director Suite 10, Acronis true image (2011 and before versions tested, I have 2 versions) as they either did not detect the drives (as raid din't seem to be supported in HDDClone) or TrueImage didn't boot from the CD properly so it probably doesn't support raid either. Disk director suite complains about there not being enough space, which isn't true..
Two problems: 1) it installed fine on VISTA. When I open it, it partially opens its window, then I get the error : "NUIBI Partition Editor has stopped working. A problem caused the program to stop working correctly. Please close the program." 2) I have two monitors. The partial window that does open, opens half on one, half on the other and will not move. Does this work without having to use windows 7 disk management? Larry Watkins, NIUBI can do everything of Win7 disk management except manage dynamic disk volumes. I think that we should skip this program since it doesn't recognize the C: drive, doesn't run properly and can't see other partitions created by other programs. If you install it you may just leave your hard drive in an inaccessible condition where you won't be able to access your programs. The author wants us to try different things and pretty much debug the program for him. I use the mini-tool partition program and it sees all of my hard drives and partitions with no problem. I think that we should skip this program since it doesn't recognize the C: drive, doesn't run properly and can't see other partitions created by other programs. If you install it you may just leave your hard drive in an inaccessible condition where you won't be able to access your programs. The author wants us to try different things and pretty much debug the program for him. I use the mini-tool partition program and it sees all of my hard drives and partitions with no problem. Thanks but no thanks. Installed on Windows 10 (64 bit) and registered without any issues, but then NIUBI Partition Editor Professional 7.2.3 reported that my Primary HDD, Drive C, is NOT FORMATTED!! I closed the program, restarted it, and got the same result: Primary HDD, Drive C, is NOT FORMATTED!! Of course it is formatted, that's where I just installed the NIUBI program! What's going on here? I just emailed a screenshot from NIUBI showing my C drive as "Not Formatted," and a MS Disk Management screenshot showing that it IS FORMATTED for NTFS. Thanks. Besides several NTFS partitions I have 2 Ext4 and 1 Linux SWAP partitions that were created with MINItool. NIUBI shows the NTFS correctly but 2 EXT3 and a "blank" field in lieu of the Linux SWAP. How come? Harald, EXT and SWAP partitions created with MINItool will be displayed as Unformatted. NIUBI Technology, No, it doesn't show as UNFORMATTED except the Linux SWAP perhaps as this shows a blank. Downloaded and installed fine on 64bit Windows10. Inputted the activation licence, fine. Went to browse through it and within seconds it disappeared. I tried a few times and still it happened. I uninstalled it and reinstalled it and the same thing happened again. I have no idea what is going on here. Anyone any ideas? UFOned, it is indeed strange, have you tried to reboot and close other running applications? Why should we have to do that? can't you make the program work properly without little tweaks and twiddles to get around the limitations that you didn't address? NIUBI Technology, Why should we have to do that? can't you make the program work properly without little tweaks and twiddles to get around the limitations that you didn't address? giveawayoftheday.com is really a great platform, there are so many lovely and professional computer users. Appreciate for all your complaints and suggestions. 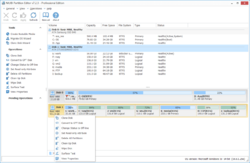 Unlike read-only program, disk partition editor software may cause system and data damage. We know, data safety and time are most important, so we spent most of our time on these field. We'll continue to add more features and improve the performance. We are glad to hear any complaints and suggestions from you. Thank you! To all GAOTD fans, giveawayoftheday.com is really a great platform, there are so many lovely and professional computer users. Appreciate for all your complaints and suggestions. 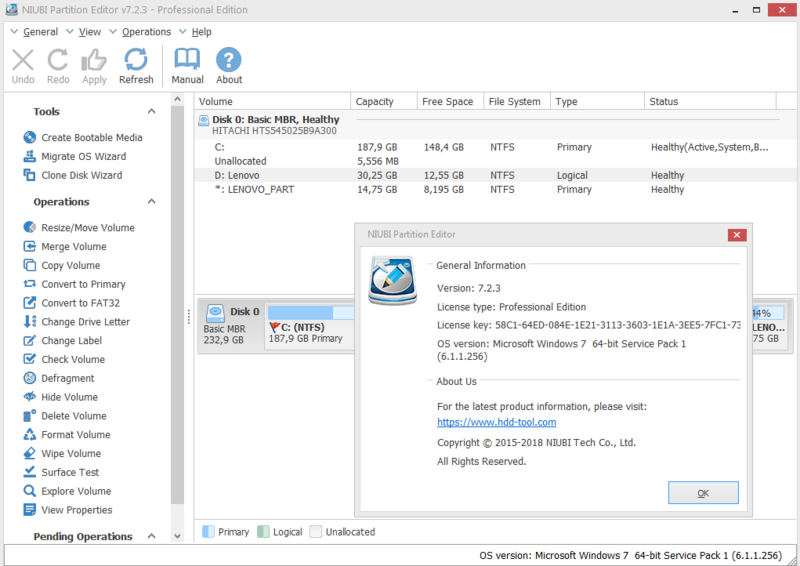 Unlike read-only program, disk partition editor software may cause system and data damage. We know, data safety and time are most important, so we spent most of our time on these field. We'll continue to add more features and improve the performance. We are glad to hear any complaints and suggestions from you. Thank you! NIUBI's Partition Editor seems a new kid on the block. As such, they're pursuing the same strategy used by EaseUS, & later AOMEI etc., offering giveaways to get their name and software out there, building recognition and hopefully a larger customer base. And like those more familiar names, there's no reason not to try it, though some may prefer the free version of a more well known brand. 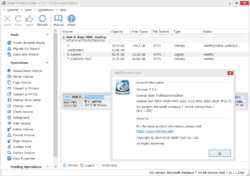 NIUBI Partition Editor Pro advertises "1 Second Rollback"... On a conventional hard drive, data written to available storage space tends to be placed towards the beginning of the disk/partition, but can still be spread out across that available space. Running defrag moves all that data towards the beginning of the disk/partition. If existing data is in the way of shrinking a partition [because defrag wasn't run], or if the beginning of a partition needs to be moved [e.g. to grow the previous partition on a conventional hard drive], partitioning software can move the necessary data for you. That's where the "Rollback" comes in, providing a bit of a safety net if things go wrong. That said, stuff happens. And because of that I'm a very firm believer in disk/partition image backups. In my opinion you should perform a disk or partition image backup on a regular basis, and if you have a current image backup on-hand, it's faster/easier/safer to just restore your partition image backups to a new partition size or arrangement or location. Besides, you really should have an image backup before doing anything with partitions, because no matter how good the partitioning software is, as I said, stuff happens -- it's your data, and ultimately you're the one responsible for it. NUIBI also talks about their partition editor scanning bad sectors -- this is somewhat dangerous territory... Most all modern hard drives have excess capacity that their firmware will use if/when a bad [defective] sector is detected by that firmware. The hard drive manufacturer may provide software that checks their drives, causing this re-mapping to happen if/when necessary, or apps like Hard Disk Sentinel include a disk test that will cause the drive's firmware to recognize if sectors are bad, and thus re-map them. When that detection happens at the firmware level, things go on as always, BUT, if a bad sector is detected at the Windows software level, that can be added to the partition's NTFS records. When that happens, some software, e.g. disk backup &/or partitioning apps, will usually refuse to work. And it's a PITA to get that bad sector count removed from those NTFS records -- one way is to *Copy* the partition somewhere else, then move it [e.g. restore an image backup] in place of the original. You can restore a backup of the offending partition on a new disk, or do a disk clone, and neither will matter -- it'll still show the drive has a bad sector or sectors. TK pointed out that NIUBI Partition Editor Pro doesn't handle dynamic disks/volumes -- for more on what those are, Google & you'll find lots of info. Since the tech is owned by Microsoft, a surprising amount of software, including from well known brands, does not fully support dynamic disks/volumes, so NUIBI is far from being alone in this regards. Obviously if you want/need this support, NIUBI Partition Editor Pro is not for you. OTOH Microsoft's Storage Spaces is newer & faster, reducing the use of dynamic disks/volumes. It would be useful to those using Storage Spaces to know if NIUBI Partition Editor Pro is 100% compatible. NIUBI's Partition Editor seems a new kid on the block. As such, they're pursuing the same strategy used by EaseUS, & later AOMEI etc., offering giveaways to get their name and software out there, building recognition and hopefully a larger customer base. And like those more familiar names, there's no reason not to try it, though some may prefer the free version of a more well known brand. NIUBI Partition Editor Pro advertises <i>"1 Second Rollback"</i>... On a conventional hard drive, data written to available storage space tends to be placed towards the beginning of the disk/partition, but can still be spread out across that available space. Running defrag moves all that data towards the beginning of the disk/partition. If existing data is in the way of shrinking a partition [because defrag wasn't run], or if the beginning of a partition needs to be moved [e.g. to grow the previous partition on a conventional hard drive], partitioning software can move the necessary data for you. That's where the "Rollback" comes in, providing a bit of a safety net if things go wrong. That said, stuff happens. And because of that I'm a very firm believer in disk/partition image backups. In my opinion you should perform a disk or partition image backup on a regular basis, and if you have a current image backup on-hand, it's faster/easier/safer to just restore your partition image backups to a new partition size or arrangement or location. Besides, you really should have an image backup before doing anything with partitions, because no matter how good the partitioning software is, as I said, stuff happens -- it's your data, and ultimately you're the one responsible for it. NUIBI also talks about their partition editor scanning bad sectors -- this is somewhat dangerous territory... Most all modern hard drives have excess capacity that their firmware will use if/when a bad [defective] sector is detected by that firmware. The hard drive manufacturer may provide software that checks their drives, causing this re-mapping to happen if/when necessary, or apps like Hard Disk Sentinel include a disk test that will cause the drive's firmware to recognize if sectors are bad, and thus re-map them. When that detection happens at the firmware level, things go on as always, BUT, if a bad sector is detected at the Windows software level, that can be added to the partition's NTFS records. When that happens, some software, e.g. disk backup &/or partitioning apps, will usually refuse to work. And it's a PITA to get that bad sector count removed from those NTFS records -- one way is to *Copy* the partition somewhere else, then move it [e.g. restore an image backup] in place of the original. You can restore a backup of the offending partition on a new disk, or do a disk clone, and neither will matter -- it'll still show the drive has a bad sector or sectors. TK pointed out that NIUBI Partition Editor Pro doesn't handle dynamic disks/volumes -- for more on what those are, Google & you'll find lots of info. Since the tech is owned by Microsoft, a surprising amount of software, including from well known brands, does not fully support dynamic disks/volumes, so NUIBI is far from being alone in this regards. Obviously if you want/need this support, NIUBI Partition Editor Pro is not for you. OTOH Microsoft's Storage Spaces is newer & faster, reducing the use of dynamic disks/volumes. It would be useful to those using Storage Spaces to know if NIUBI Partition Editor Pro is 100% compatible. Did anyone read the log-file "scan_log.txt"
- when i click on OK, new message : ""Access violation at address 00007FFF521AEA7D in module ’dm.api'. Read of address 0000000000000000." - if I click on OK after the second message and click the buttons next or cancel on the window of create media, new message : "Access violation at address 0000000000C77664 in module ’npe.exe'. Read of address 0000000000000030." - I then must close again the program via the task manager ! About "Create bootable media" : - when i click on this button, a message says : ...here is no Windows AIK/ADK detected in your system,... (win 8.1) - when i click on OK, new message : ""Access violation at address 00007FFF521AEA7D in module ’dm.api'. Read of address 0000000000000000." - I close the program via the task manager and install ADK but the 2 messages remain the same… - if I click on OK after the second message and click the buttons next or cancel on the window of create media, new message : "Access violation at address 0000000000C77664 in module ’npe.exe'. Read of address 0000000000000030." - I then must close again the program via the task manager ! What do you mean with the main window ? NIUBI Technology, What do you mean with the main window ? would you like us to debug your program and troubleshoot it so that it works as intended? So far i see that it doesn't run once installed and when it does run it can't recognize the C: drive and it can't recognize the formatted drives and existing partitions because they were created with another program. Did I miss anything or is there more problems? would you like us to debug your program and troubleshoot it so that it works as intended? So far i see that it doesn't run once installed and when it does run it can't recognize the C: drive and it can't recognize the formatted drives and existing partitions because they were created with another program. Did I miss anything or is there more problems? Belga, the window after starting NIUBI, where you'll see all disk partitions. NIUBI Technology, Done...thank you ! Does it work on Windows XP 32-bit? I installed this over a previous version and it starts fine. Didn't try any disk operations though. Firstly I'd like to thank both GOTD & NIUBI for today's download. Installed on Windows 10 (64 bit) and registered without any issues and have used it to resize and create a new partition on a drive which was quick and painless. I see a lot of people complaining about certain features not being available, my answer to that is install something that has the features your looking for. Personally, I find this suits my needs, I have more powerful partition software on my other PC but I'm using this on a new build it's perfect for what I need it to do. Best Disk Partition Manager for Windows PC." I see no mention of what formats I can produce or administer with this partition manager... I would want to also be able to customise the file systems cluster size in all file systems that support that option on creation. Since it is possible to add an installable file system into windows to get read write access to various non-microsoft file systems like ext2,3 or 4 and probably more obscure file systems THE "Best Disk Partition Manager for Windows PC" should not only handle ALL microsoft installed file sytems but also other commonly used file systems like those used in various linux distros it should certainly do everything ancient Partition Magic did as well as support GPT and dynamic volumes and hardware and software RAID drives. Otherwise how can it be the "Best" of anything? 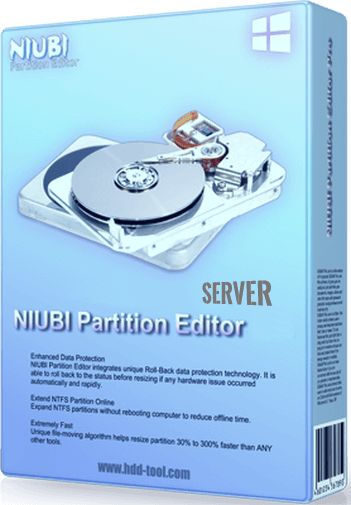 This giveaway is advertised here thus: "Giveaway of the day — NIUBI Partition Editor Professional 7.2.3 Best Disk Partition Manager for Windows PC." I see no mention of what formats I can produce or administer with this partition manager... I would want to also be able to customise the file systems cluster size in all file systems that support that option on creation. Since it is possible to add an installable file system into windows to get read write access to various non-microsoft file systems like ext2,3 or 4 and probably more obscure file systems THE "Best Disk Partition Manager for Windows PC" should not only handle ALL microsoft installed file sytems but also other commonly used file systems like those used in various linux distros it should certainly do everything ancient Partition Magic did as well as support GPT and dynamic volumes and hardware and software RAID drives. Otherwise how can it be the "Best" of anything? TK, the current version does not support dynamic disk volumes, we'll add this support in the future. Of course it is better to support more types of disk and partition. In current version, we focus on data safety and speed, because they are most important. We have the plan to add more functionalities in next versions. Question, on my Win10 64bit I plan to migrate to a larger HDD. Will this clone my entire HDD, including OS to the new HDD? Thanks, I appreciate your quick response. to NIUBI Technology do any of you editions of this software do anything with the returned scan for bad/damaged sectors? Do you offer to remap those bad sectors from the spare sector pool that exists in ALL modern hard drives? To make a damaged drive maybe due to inadvertant power outage mid write fully usable again. If not what is the advantage of your scan for bad/damaged sectors over Windows own built in scan for damaged sectors? TK, Sorry NPE does not remap the bad sector, it just scan if there is. To ensure data safety, it is better to replace the disk drive if there are bad sectors. NIUBI Technology, All hard drives have bad sectors. So you are saying to replace all hard drives and another hard drive that will already have a bad sector. Com On Man. NIUBI Technology, Maybe you should add the remapping of SMART attribute current pending sectors? It is incorrect that you increase data safety by trashing an entire drive with a single bad sector NOT caused by age or mechanical failure. You throw away perfectly good data and media. frequently I have had customers laptops that are stuck in an infinite reboot cycle due to a damaged sector caused by a sudden power loss during a write to the disk and because there is no user interface to report the error during the early part of the boot process it aborts the boot and restarts the machine. In those cases invaribly scanning the disk and remapping the one or two bad sectors permits windows to boot and use windows file protection to repair certain critical files and NTFS journaling to repair the file system. The customer is then advised to buy a new battery and not to FORCE a shut down by holding down the power button while the hard drive light is on. Also remapping the damaged sectors would then allow cloning of the old drive to a new drive... in many cases drive cloning software will not properly clone a drive with actively unreadable sectors but will if the bad sectors are remapped and after cloning the corrupted files can be restored from backups of course. Remapping should be an available option in any hard drive tool in my humble opinion. NIUBI Technology, Maybe you should add the remapping of SMART attribute current pending sectors? It is incorrect that you increase data safety by trashing an entire drive with a single bad sector NOT caused by age or mechanical failure. You throw away perfectly good data and media. frequently I have had customers laptops that are stuck in an infinite reboot cycle due to a damaged sector caused by a sudden power loss during a write to the disk and because there is no user interface to report the error during the early part of the boot process it aborts the boot and restarts the machine. In those cases invaribly scanning the disk and remapping the one or two bad sectors permits windows to boot and use windows file protection to repair certain critical files and NTFS journaling to repair the file system. The customer is then advised to buy a new battery and not to FORCE a shut down by holding down the power button while the hard drive light is on. Also remapping the damaged sectors would then allow cloning of the old drive to a new drive... in many cases drive cloning software will not properly clone a drive with actively unreadable sectors but will if the bad sectors are remapped and after cloning the corrupted files can be restored from backups of course. Remapping should be an available option in any hard drive tool in my humble opinion. kenkobra, quite right though most do not know this as the pre-exisitng state of a new hard drive is to have pre-remapped the factory bad sectors with the remapped count reset to zero... we are not entitled to know the true starting state of a hard drive like we were in the days of FM/MFM and RLL non-ide drives that had their low level format subroutines in their own BIOS ROM. Very comparable to other software and runs without problem. type of program, clones, shrinks, expands and partitions without any problems. It is faster than some that i have tried. Thank you GTOD and NIUBI Tech. Downloaded, installed and registered without problem on my Windows 7 Ultimat 64bit. Very comparable to other software and runs without problem. Tried it out on two spare drives that i use as test drives for this type of program, clones, shrinks, expands and partitions without any problems. It is faster than some that i have tried. Thank you GTOD and NIUBI Tech. Installed on my Windows 7 64 bit machine without any problems. Looks like a nice bit of software. I don't have a need for it now but in the future I will be sure to use it. Thanks NIUBI for the lifetime license and thank you GAOTD. Lifetime licensee is good. but the only business I knowingly do with China is through Newegg, for hardware. I also prefer Russian and Eastern European software and hardware to Chinese. Thanks for the offer. I would have tried the clone feature first. I installed and got message "storage access driver failed to install". Uninstalled, rebooted and tried again with same problem (twice). Could it be my system? I installed and got message "storage access driver failed to install". Uninstalled, rebooted and tried again with same problem (twice). Could it be my system? Heya, just to ask, Test Defragment option on SSD and don't know what actually program do in this case. It seems it's not trim, because operation is slow. Sony Georgiev, the speed depends on the system state and how much files in the partition. NIUBI Technology, why would it depend on anything to do with files on the partition? Surely no defragmenter of merit should even attempt to defragment an SSD without multiple warnings since it is an almost no win operation... file fragmentation on any modern SSD makes no mesurable degradation to file access performance on modern systems, file undeletion is not possible on TRIM supported SSD drives on TRIM supported hardware and OS since the deallocation of file deletion causes the SSD firmware to hide and to a queue to erase deallocated memory cells. There is only one forseeable procedure where defragmented SSD would be benificial is if the file systems structure is corrupted by some malicious software rendering a partion inaccesable but not formally deleted so not deallocated using TRIM commands then unfragmented files data would be easier to recover but that scenario is VERY rare and not worth crippling the longevity of a SSD drive defragmenting it just on the off chance of a very rare and specific failure scenario. I sometimes have to defragment ISO files on flash drives, so i can boot them via GRUB4DOS, etc. What version of Windows are you using? Most all defrag apps use the Windows api. In win10 running the defrag process -- in win10 it's called Optimize -- recognizes SSDs and performs TRIM rather than defrag. IOW it ***might*** be something that works properly in win10, but not earlier versions of WIndows. Sony Georgiev, What version of Windows are you using? Most all defrag apps use the Windows api. In win10 running the defrag process -- in win10 it's called Optimize -- recognizes SSDs and performs TRIM rather than defrag. IOW it ***might*** be something that works properly in win10, but not earlier versions of WIndows. mike, I use Windows 10 and just try defragment for test and what program will make. But it seems to run slowly, because trim usually is fast. System is process, that do defragment in TaskManager. Note there is a free edition. The professional edition comes with bootable media and '1 second rollback technology' - it'll recover if there is a problem while performing a partition operation. Chris, not to mention the non-clickable CNET, PCWorld, Softpedia etc. stellar reviews. Anyone is free to claim they're the best. From the description, it's not convincing it's in anyway better than Minitools, Aomei, etc which are all free! Can anyone shed any light, in what ways it's the best? Anyone is free to claim they're the best. From the description, it's not convincing it's in anyway better than Minitools, Aomei, etc which are all free! Can anyone shed any light, in what ways it's the best? King, check "Featured titles by NIUBI Technology", on this page, you will probably understand that these titles are used by proffecionals. King, They do not claim that it is the best, but maybe it is. Zen , the subhead shows: "Best Disk Partition Manager for Windows PC"
King, actually, the subhead is provided by GOTD. pete nicholls, NIUBI Partition Editor supports up to 32 TB hard disk.